The Washington Post is reporting that Syrian rebels, struggling to finance their effort, have joined an emerging trade in illicitly acquired Syrian artifacts and antiquities, emotively phrasing it: "selling off the country’s past as the war for its future intensifies". As the war nears its third year, the United Nations and conservationists warn that Syria’s historical sites face a new and more dangerous threat: a sophisticated network of smugglers and dealers — prime among them members of the cash-strapped insurgency — looking to capitalize on the country’s cultural riches. [...] The extent of the trade is unknown because of difficulties accessing historical sites in the war-torn country [...] Average hauls can command $50,000 on the black market, rebels said in interviews.[...] Jordan has emerged as the primary first stop for the goods, according to the rebels, who said Turkey and Lebanon also are active markets. The rebels and Jordanian security sources say most of the illicitly acquired artifacts are smuggled into Jordan amid the daily influx of about 2,000 refugees. They end up on the market in Amman, the Jordanian capital, where merchants have reported a flood of Syrian artifacts in recent weeks. “Every day we are getting calls about Syrian gold, Syrian mosaics, Syrian statues,” said Mohammed Khalil, an antiques dealer in Amman. If this is so, if items are being dug up to finance the purchase of weapons and explosives, once again the seemingly innocuous no-questions-asked antiquities trade in minor bits like coins, small seals or inscribed tablets - in short the more portable antiquities - turns out to be filling up with more blood antiquities. This is not the first time this has been pointed out. The Washington Post article echoes the concepts underlying earlier reports (such as Aryn Baker and Majdal Anjar, 'Syria’s Looted Past: How Ancient Artifacts Are Being Traded for Guns', Time September 12, 2012 - which I disuss here). To what extent is this actually happening, and to what extent is this propaganda being fed to journalists by the state to discredit the rebels against its authority? I am a little sceptical because in the same article we read more about this trade, except this time the objects are reportedly crossing the border to enter the international market among refugees fleeing the fighting. In Amman, Syrian smugglers and intermediaries said the artifacts command prices that range from $50 for a stone vessel to $3,000 for statues and stone tablets. Jordanian traders then sell the items for prices that are three times as high. [...] Increased pressure from authorities has begun to scare Jordanian merchants off the trafficked goods. But the merchants often serve as middlemen, arranging meetings between smugglers and private collectors or traders who export antiquities to Europe, North America and Asia. The items have yet to hit international auction houses, said Martin Wilson, general counsel for Christie’s and head of its art law department. But Wilson said Christie’s would remain “vigilant,” because “it is possible that in years to come, they may be offered to us when they have passed through many hands”. It surely is not the case that the rebels are selling antiquities to refugees for cash with which they then buy guns. What is being described here is two different things, and again one wonders just how much journlists are cobbling together snippets of information from various sources (including some they are 'fed') to produce a roughly-coherent story, when the situation is far more complex. If its not taken by the refugees in the story, then do the rebels get their gun-finacing loot out of the country? I am not clear if the rebels are reported to be in control of any border crossings. So, since the archaeological record of Syria is now in danger of "pillage" is the US going to create a bilateral cultural property agreement with the government and people of Syria? Taylor Luck, 'Syrian rebels loot artifacts to raise money for fight against Assad', Washington Post Wednesday, February 13. 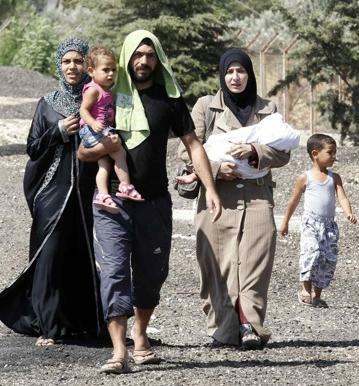 Vignette: Syrian refugees fleeing the fighting.